Dhaka, 4 June, Abnews: The residents of Doulatpur and Harirampur upazilas have been passing days amid worries as violent riverbank erosions by the Jamuna and Padma devoured several hundred dwelling houses in the two upazilas over the last one week. Officials at the Water Development Board (WDB) here said they have nothing to do right now as they do not have any fund, while elected representatives are saying that lack of efforts to have a permanent solution to the problem is the main reason why local people are getting displaced every year. For the past few days, Char Katari, Bachamara, Baghutia and Jionpur unions have lost a substantial portion of their lands, houses croplands, one mosque and a madrasah to the river erosion. Azmat Ali, a resident of Char Katari, said river erosion this season started earlier than previous years, as the river has come dangerously close to his house, which will devour it if the erosion continues. Chairman of Char Katari union parishad Abdul Barek said Jamuna bank erosion devoured 16 of 18 villages under his union over the last several years. This year, if the erosion continues, it will engulf the remaining villages. Rikta Akter, headmistress of Bachamara Uttarkhand Primary School No. 44, said her school stands threatened by the river erosion. Rikta said she sent letters to the higher authorities over the matter on a number of occasions but no step has been taken yet and the fate of over 200 students remain uncertain. Daulatpur Upazila Nirbahi Officer (UNO) Kaniz Fatema said several applications have been sent to the WDB seeking steps to check the river erosion, but there has been no response so far. Besides, erosion by the Padma River has already devoured over 50 houses, croplands in three unions of Harirampur upazila . Abul Bashar, vice chairman of Harirampur upazila, said a permanent dam was built two years ago spending Tk 100 crore by WDB, but it covered only 10km out of the total 14 km areas which are affected by erosion. The erosion caused from the remaining 4km is damaging the dam, he said. Mamun Hawlader, a deputy assistant engineer of Manikganj WDB, said a Tk 3.65 crore project has been undertaken to protect Bachamara union from the Jamuna erosion, which awaits approval. 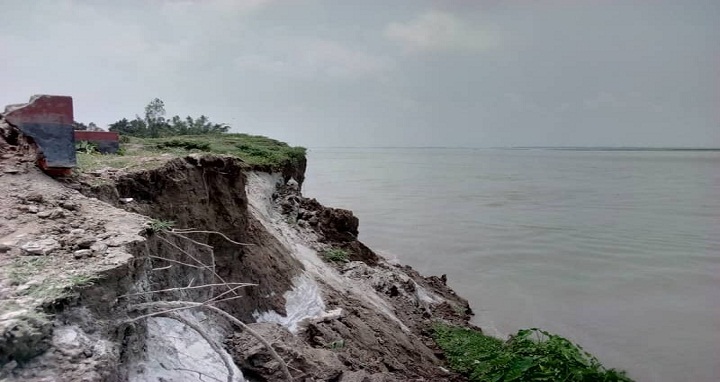 AM Naimur Rahman Durjoy, an MP from Manikganj-1 constituency, said usually temporary measures are taken every year to minimise the damages caused by erosions, but there is no sustainable approach to deal with the situation.